You are here: Home » GENRE » Anime/manga » Monster Hunt: English Version (DVD film review). Monster Hunt: English Version (DVD film review). ‘Monster Hunt’ is a Chinese comedy film that is part-live action and part-animation. Telling the story of a human man who gives birth to the new monster king, it is a light-hearted martial arts romp with an endearing fantasy slant to it. Having been successful in its native China, it has now been released on DVD in English for the first time. My husband is going to hate it. My dad is going to love it. To deal with points 2 and 3, I took it home when I visited my parents, without my husband, and sat down with them to watch it. My dad loves silly martial arts films, mum likes something that has a feel good element or a bit of quirkiness about it and I like something that lets me escape into another world for a while. 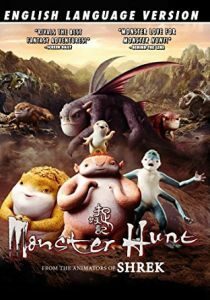 ‘Monster Hunt’ fulfils all these requirements, having some incredible fight scenes, a kind of slapstick humour that is rare outside the Asian film industry and, at its heart, an endearing tale of love and responsibility as the human dad tries to keep his baby monster safe from the monster hunters who are out to kill it. There are a few scenes that really stood out for their comedy, with my favourite probably being a scene where a top chef tries to cook a monster for a crowd of rich patrons. Without giving too many spoilers away, let’s just say this did not go well for the chef. I really enjoy this kind of physical comedy, portrayed both through regular actions and through spectacularly choreographed fight scenes. It never fails to bring a smile to my face. I did find a few things disappointing about the film, though. For a start, the pacing was not quite right. It started off with a long introduction, had too much meandering in the middle and then finished up very abruptly. All of it was punctuated nicely with fight scenes and animated sections but in terms of the pace of the actual story, it was all over the place. I also found it a real shame that the DVD didn’t come with the original Chinese soundtrack as we only had the option of English dubbing. I can just about get past the twitchy feeling I get when what you can see the actors’ mouths doing and what you can hear clearly doesn’t match, but I feel that the film itself loses character when you apply English-speaking voices. They just don’t have the same kind of delivery. I would much rather hear the original actors and read English sub-titles, so was disappointed to find this wasn’t an option with this release, although English sub-titles for the hearing impaired are included. I also completely failed to find the cast list anywhere on-line for the English voice actors, so it would have been nice to have an insert including this. Despite its flaws and the lack of synchronicity between the English-speaking voices and the Chinese action, I did enjoy watching this film, although it won’t be making it onto my favourites list any time soon. My parents each rated it a solid 4 out of 5 and I gave it a more cautious 3 out of 5. Fun to watch with the family, but nothing ground-breaking or challenging. « Hounded (The Iron Druid Chronicles book 1) by Kevin Hearne (book review).